Two of the best loved and most successful French films of modern times, Yves Robert's La Gloire de Mon Père and its sequel Le Château de Ma Mère will be released for the first time ever as a two-disc box set and its first ever UK Blu-ray release. 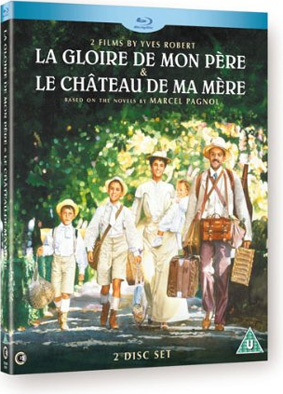 An adult Marcel nostalgically recalls idyllic retreats with his family to the hills of Provence. His love affair with the country began and during those perfect days he found new respect for his school-teacher father as he adapted to life away from the city, while the long journey there would soon bring its own adventures. Based on the childhood memoirs of Marcel Pagnol the author of Jean De Florette and Manon Des Sources, these timeless classics stand as one of cinema's greatest celebrations of childhood, filled with warmth, love and a poignant nostalgia for bygone days they continue to captivate audiences (that's a quote from the press release, in case you thought I'd suddenly gone soft). La Gloire de Mon Père and Le Château de Ma Mère will be released as a 2-disc box set on DVD and Blu-ray on 5th November 2012 by Second Sight at the RRP of £29.99 for the DVD and the same for the Blu-ray.